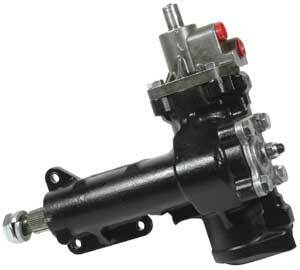 This is a remanufactured modern day Delphi 600 steering box featuring a modified 1 piece case. Uses stock pitman arm and bolts to stock mounting location. This box utilizes an 18mm offset Double D connection and 16mm and 18mm O-ring fittings. Use of a replacement column shaft, aftermarket column or modified stock column is required. If car was equipped with factory power steering a drag link adapter or drag link from a manual steering car will be required. 3 year warranty. Note: See rag joints below.